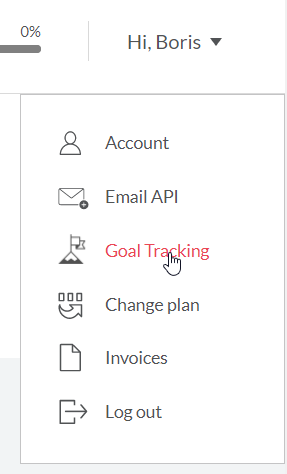 Note: Goal tracking is available in Pro, Expert and Enterprise plans. 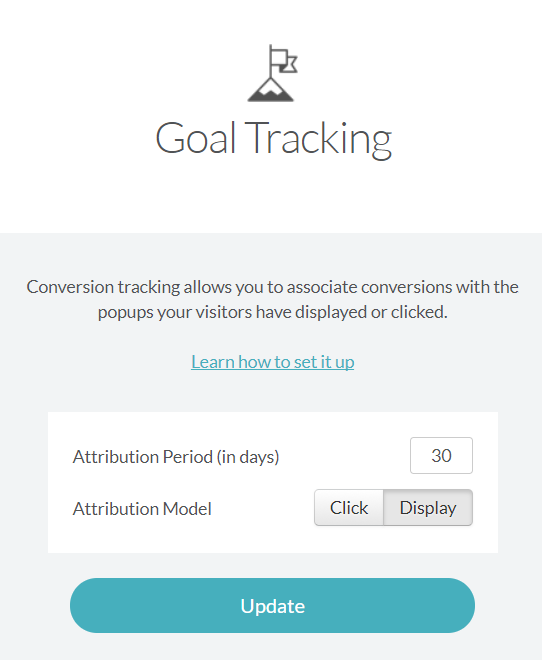 Goal and revenue tracking allow you to monitor how many conversions and how much revenue were generated by your popups. "goal" : String that indicates that you want to track a goal. Leave it as it is. goalName (optional) : You can name your goal. For example : "purchadedItem"
This is the period of time after a customer interacts with your popup during which a conversion is recorded. Let’s say your attribution model is click. Your visitor clicks on one of your popups and leaves your website without buying anything. He comes back 8 days later and purchases a product. If you set your conversion window to 10 days, a conversion will be recorded and associated with the popup the viewer clicked on before. If you set it to 7 days, it won’t be recorded. The longer the window, the more conversions you will associate to your campaign. The attribution model allows you to control which kind of interactions can be associated with conversions. If you pick displays, then conversions will be recorded and associated to your popup as soon as your popup is displayed. If you select clicks, then your visitors will have to click your popup or sign up before a conversion is triggered. Select the DISPLAY model for promotion popups which don’t have to be clicked on to impact your sales. For example, if you display a promotion coupon, it will impact all visitors seeing the coupon. In that case, you should attribute the sales to popup displays, not clicks. . Select the CLICK model for popups which have to be clicked to impact your sales and conversions. For example, if you’re giving a coupon to visitors who sign up, you should attribute the sales to clicks, as only visitors who click (or sign up) will get the coupon. After setting the goal tracking client-side, you can view results on "Reporting" page. You can access it by clicking "REPORTING" on top left of wisepops panel. If the wisepops() function is not defined, please make sure that the WisePops tracking code is up to date.